Mitochondria work pretty fast. If you don't stop and look around once in a while, you could get their numbers wrong. One of my favorite aspects of editing is that I regularly discover new quirks of language. Daily, I'm confronted with a previously unencountered linguistic situation. What this always leads to is the opportunity for a little autodidacticism, catalyzed—and necessitated—by research. After all, if I don't perform the research, there's no way I can know if I'm doing my job properly. Getting the opportunity to edit texts from a wide range of intense fields means that I regularly run into grammatical situations I have questions about. Today, for instance, I was editing a text on anti-Darwinism (here's an introduction to anti-Darwinism that completely ignores the current state of things), in which I encountered the phrase "mitochondria is" multiple times. I remember mitochondria from my basic, biology courses. That's where our energy is stored and produced. Anyway, it turns out that the squiggly green line under the phrase was correct. That is a grammatical issue. You see, mitochondria is plural. Its singular form is mitochondrion. (As a side note, let me introduce you to a new word: "chondriosome;" it's synonymous with mitochondrion.) 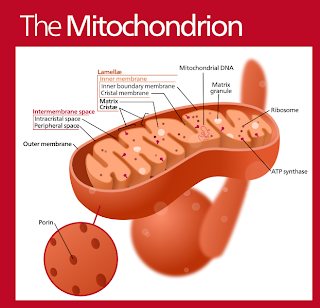 So, what we should be saying is "mitochondrion is" or "mitochondria are." Even editors can't know everything about language, and little stumbling blocks like this are what make the internet such a great resource. Stopping work to research something simple like this can be a bit of a hiccup to a day's productivity (especially if it happens half a dozen times an hour), but it's that attention to detail that, in the end, clearly distinguishes a finished, professional publication from its glanced-over, amateur alternative. That extra step should never be taken lightly, no matter how insignificant it may seem. The situation might be a bit murkier, though. On the one hand, Greek treats collective plurals (e.g. neuter plural μιτοχονδρια) as grammatical singulars, so in Greek τα μιτοχονδρια εστι...'mitochondria is' would be grammatical (τα βιβλια "the books" is treated as a singular when borrowed into English as "the bible"). We have the same tendency in English, "data," "bacteria," and so forth, to treat collectives as a singular. Exactly the sort of intricate typology that makes it worth talking about! Since the text I'm editing seems to specifically argue that the mitochondria aren't working collectively but are, rather, each independent operators, I think the collective case is ruled out of use. That said, do you predict any changes in the grammatical handling of collective plurals and related situations due to the internet's continued effects on common grammar?